BMW today showed its latest green model for the U.S., the 530e iPerformance plug-in hybrid. It’s part of the newly redesigned 5-Series lineup. The 530e is powered by a turbocharged 2.0-liter 4-cylinder gasoline engine, which makes 180 horsepower and 215 pound-feet of torque, mated to an electric motor with 95 horsepower and 184 lb-ft of torque of its own. Total system output is 248 horsepower and 310 lb-ft of torque, and BMW says the car can accelerate from 0 to 60 mph in 6.1 seconds and reach a top speed of 130 mph. The transmission is an 8-speed automatic with paddle shifters. Rear and all-wheel drive will be offered. A 9.2 kwh lithium-ion battery pack allows the motor to power the car on electricity alone or to aid the engine. The car comes with three eDrive driving modes: Auto, Max, and Battery Control. In Auto, the system blends the engine and motor to optimum effect and allows for all-electric driving up to 56 mph. In Max, all-electric driving extends to 87 mph, but the engine kicks in when drivers ask for more or use full throttle. Battery Control mode lets the driver choose the charge level and the system keeps the battery level constant or increases it. One purpose for this setting would be to increase the charge so city driving could be done using only the electric motor. The battery pack can be charged in seven hours on a 120-volt outlet or three hours on a 240-volt outlet. It sits under the rear seat, so it doesn’t interfere with the 14.5 cubic feet of trunk space. BMW isn’t quoting an all-electric driving range, or EPA MPGe or fuel economy ratings at this time. The 530e gets some unique styling elements from other 5-Series models. On the outside, there are blue slats in the twin kidney grille, blue wheel hub covers, and “i” badges and “eDrive” emblems. Inside, the door sills have illuminated “eDrive” lettering, the aforementioned eDrive button sits on the center console, and BMW provides unique displays for the instrument cluster and center screen. 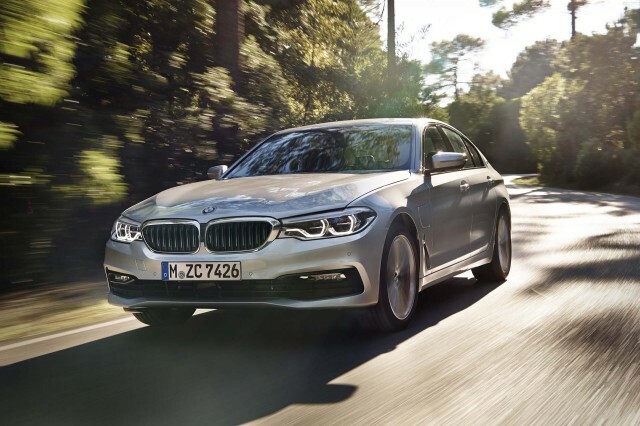 Otherwise, the new 530e will offer many of the technology and safety features from the new 5-Series, including the latest-generation iDrive control system with gesture control, adaptive cruise control with stop and go, an Evasion Aid system to steer around dangerous obstacles, and lane keep assist, among others. The BMW 530e iPerformance is due at dealers this spring as either a 2017 model.